Turned an $8B loss into an $8.4B profit. One of the most significant contributors to this positive performance was the sharp increase in designer and engineering productivity thanks to greater parts reuse. The Aberdeen Group estimates that engineers spend up to 45% of their time searching for or recreating parts that already exist. 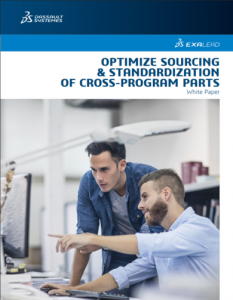 The loss of valuable engineering time can be significant in sectors whose products include high volumes of simple parts, like industrial equipment, big-ticket consumer goods, aerospace and defense, and transportation. Consider, for example, a typical automotive engine. Simple fasteners make up more than 40% of the engine’s components. If simple parts like this can be standardized and easily reused, the number of valuable engineering hours that can recouped for higher value tasks is very high. Represents 20% to 40% of retooling costs. In order to help companies realize these competitive advantages, EXALEAD developed a solution uniquely designed to eliminate the barriers that have to date impeded effective standardization, reuse and sourcing to facilitate make, reuse or buy decisions company-wide.